Hands up if you like the sound of “hassle-free entertaining”? Yeah, me too. Especially when you know there will be a lot of other things to worry about like last-minute gift wrapping, keeping an eye on the goose stuffed into your tiny oven or going into labour with your third child… This ice cream cake is the ideal make-ahead dessert and with its tart, refreshing coolness, will round off a heavy Christmas meal perfectly. 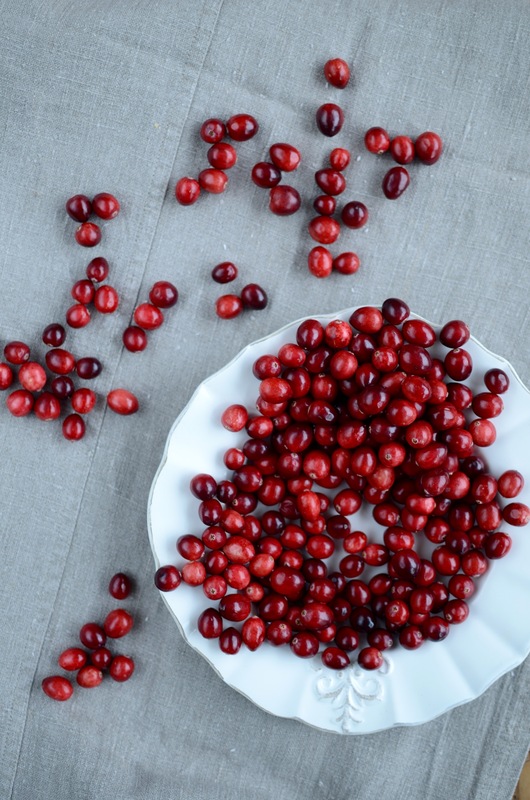 Place the ingredients for the compote in a heavy-based saucepan over a low heat and stir to dissolve the sugar, before turning up the heat and simmering gently for about 5 minutes, or until the cranberries are tender. Allow to cool slightly before blending everything until smooth. If you don’t have a high-speed blender, remove the vanilla pod, scrape out the seeds and return these to the cranberry mix. Discard the pod. Set aside to cool completely, preferably in the fridge. To start assembling the cake, allow 500ml of the ice cream to soften at room temperature. Mix 250ml (1 cup) of the cranberry puree with 450ml of the ice cream until well blended, spoon into a 15cm cake tin, smooth the top and place in the freezer for at least 10 – 15 minutes or until frozen. In the meantime, replace the left-over ice cream in the freezer and leave the next 500ml of ice cream at room temperature to soften. For the second layer, mix 125ml (1/2 cup) of the cranberry puree with 500ml ice cream until well blended. Spoon on top of the first layer, smooth the top and place in the freezer for 10 – 15 minutes. Finally, use as much of the remaining softened plain vanilla ice cream as is necessary to fill the tin to the top and return to the freezer. Leave for several hours or until solidly frozen. About 15 minutes before serving, remove from the freezer and allow to soften. Carefully remove the tin (you may want to run some hot water around the tin or use a blow torch if it is still solidly frozen) and place the cake on your serving plate with the vanilla layer on top. 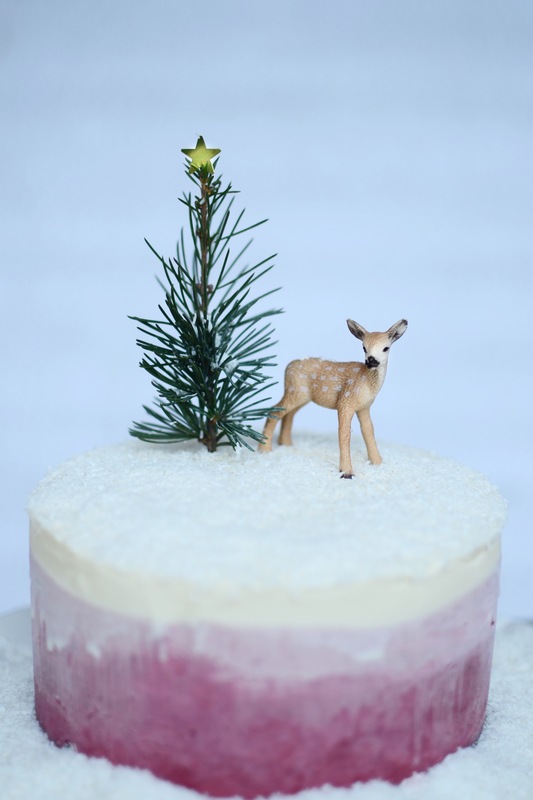 Sprinkle the coconut around the base and on top to create a snowy landscape. 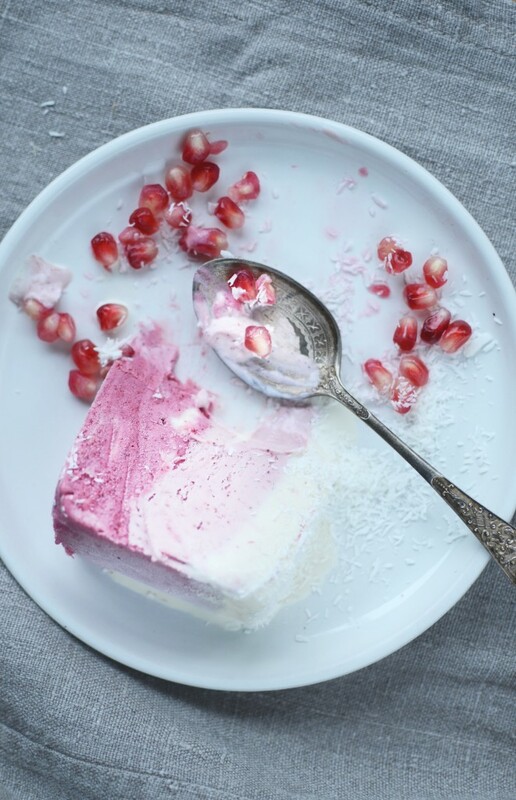 Bring the cake to the table and wait until it is soft enough to cut into slices, before serving with fresh pomegranate seeds. thanks for posting the recipe. I Love the snow-effect of the coconut. Cannot wait to try it as I love making (and eating of course) my own ice cream…have actually been struggling to find fresh cranberries, but will try harder – any tips for the SE area? Have a very merry Christmas and a peaceful and happy time with your family. All the best for the New Year!